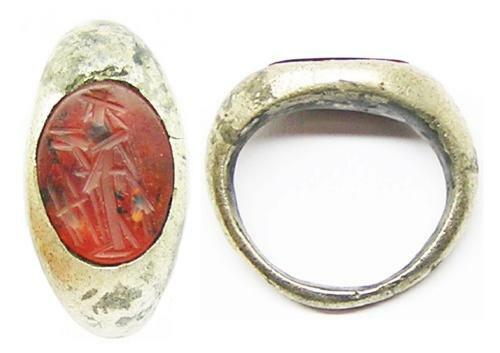 This is an ancient Roman silver intaglio ring, dating to the 2nd century A.D. It is set with its original sard / dark red carnelian gemstone, simply cut with a stylized image of the goddess Ceres. She holds ears of corn in her left hand and a dish in her right, in front of her appears to represent a tripod altar or incense. Similar gem intaglios were found in the Snettisham Jewelers hoard, dated to c. 155 A.D.
Ceres was the goddess of agriculture, so the original owner would have been connected with farming and trade. The intaglio used to seal and authenticate letters and transactions. The ring is in excellent excavated condition, with the original gem. The lower band has an ancient cut mark, to test for plated silver. This ring is solid silver, though slightly debased. The ring will easily clean up and can be worn again today with care.